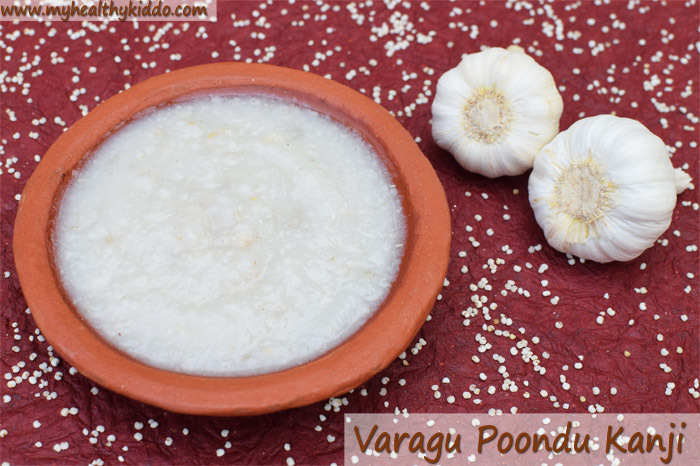 Kodo Millet Porridge(Varagu kanji) is just not tagged for diabetics. Everyone of us can have this healthy breakfast/dinner to keep diabetes at a distance. 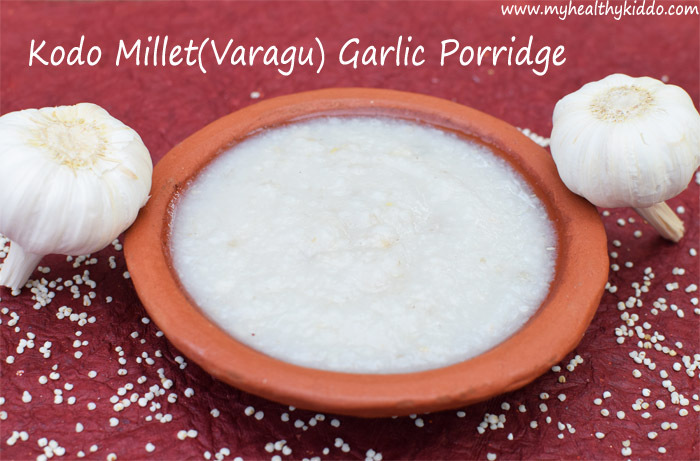 Millet, Garlic, Black gram and Fenugreek are a versatile combination to boost mother’s milk. It also supplies essential nutrients to moms, pre and post delivery. Obviously the right choice for GDM(Gestational Diabetes Mellitus – Comonly called as “(High) Sugar”) Moms. 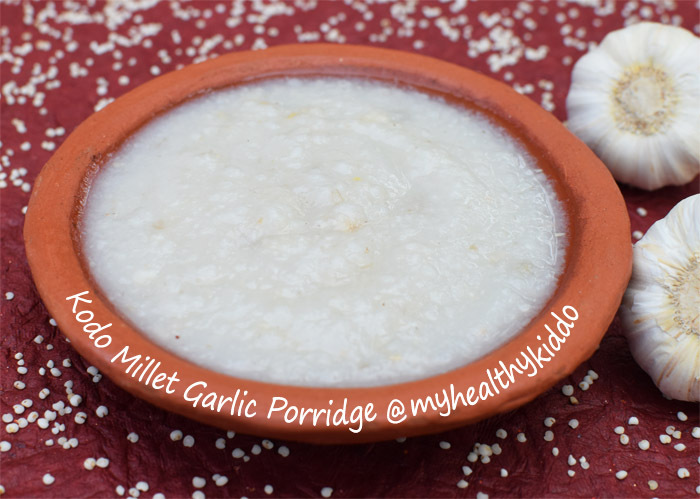 Persons without hypertension(High BP) can enjoy this porridge with dry fish fry(Karuvaadu poriyal), which will be my next post for sure 😉 Others can have with Coconut/Mint/Coriander thuvayal. 1.Wash kodo millet twice or thrice. Take millets using hand from water(as shown below) so that any sand/stones will settle down in water. After washing, soak in clean water until required. 2.Peel off the skin of garlic. Dry roast urad dal until slightly browned. Dry roast garlic cloves until nice aroma is released out. In a pressure cooker, add soaked kodo millet. 3.Add dry-roasted urad dal and garlic cloves along with some fenugreek seeds. 4.Add water 6 times of the millet measurement. Add required salt. 5.Pressure cook for 5 to 6 whistles or until mushy. Let the pressure release naturally. Mix well and add some hot water to dilute it to your desired consistency. Leaving 1 or 2 garlic skin unpeeled gives nice aroma to your kanji. If having in the day time, you shall replace a cup of water with a cup of milk while pressure cooking to enhance the flavor. When cooking specially for babies, you shall decrease garlic, urad dal and fenugreek seeds. Can opt for additional 2 whistles too.